Registration is between August 10 and September 3. 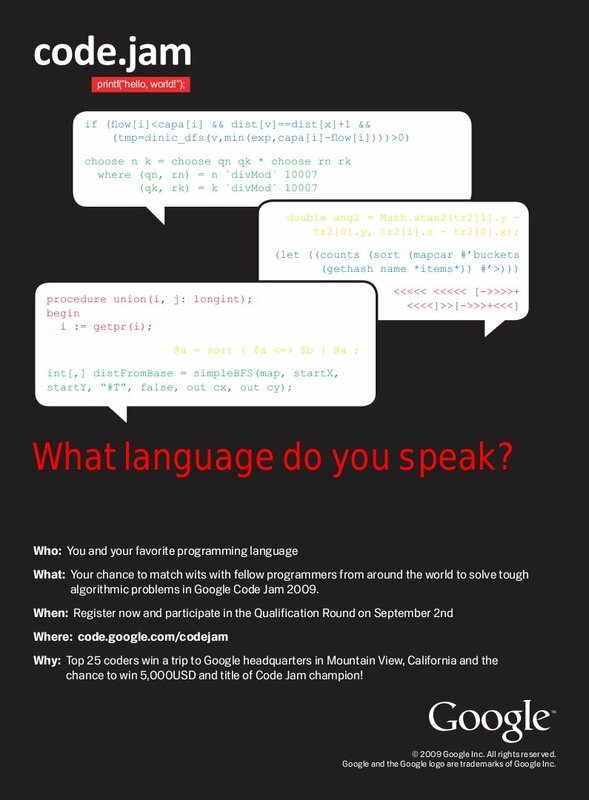 Google Code Jam starts in September, when you will compete in online rounds against contestants from around the world. From the ranks of those contestants will be chosen the 25 best, who will travel to Google headquarters in Mountain View, California. There, on Friday, November 13, they will compete for ACRush's title of Code Jam Champion, and the grand prize of $5,000. PS: Some students are organising a get-together in TSL for the qualification round at 16:00-18:30 on Thursday 3 September ... and will probably do so again for at least round 1. Contact Marco Gallotta for more info ... or watch out for announcements on Facebook!